It’s the 4th of July 2013 – Happy Higgsdependence Day! It is exactly one year since the observation of a ‘Higgs-like particle’ was announced at CERN in the auditorium in which I now sit. I remember stealthily watching the live stream of the announcement at my office desk last year. If you had suggested to me then that one year later I would be working at CERN I would have told you (in a broad Northern Irish accent) to ‘catch yourself on’. 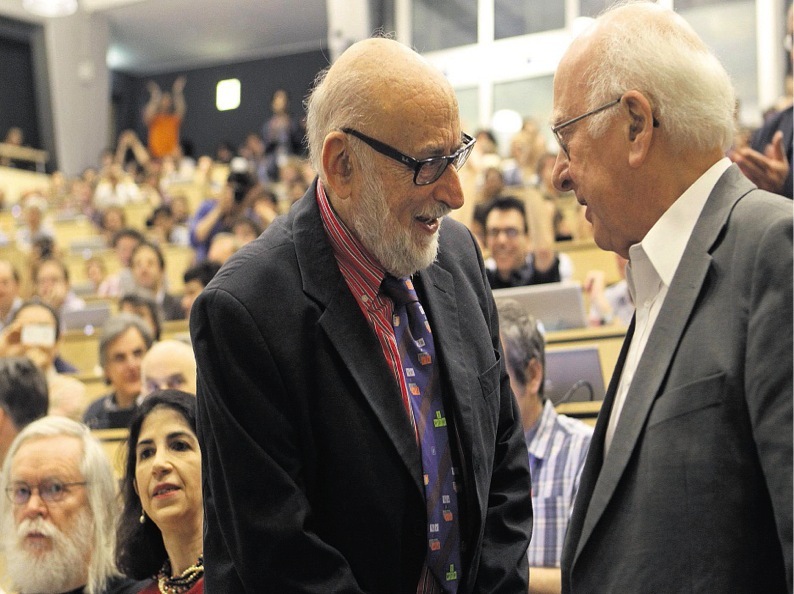 Peter meet François – Professors Higgs and Englert, who collaborated during the 1960s, meet for the first time on 4 July 2012. Notice the back of the room is filled with last years summer students who camped overnight for seats for the Higgs announcement. This of course means that the summer lecture series has started in earnest with a gentle introduction to the ‘Particle World’ from Dr Tara Shears. I understand the content of the lecture so am feeling confident, comfortable and optimistic. Until lecture series Day 2 when Dr James Wells hits us with his lectures on the Standard Model – our best model for explaining the interaction of fundamental particles. James is an eminent theorist and is clearly at the top of his game. He poetically weaves an intricate mathematical web to explain the subtleties of the Standard Model using an area of mathematics known as Group Theory. I nod along knowingly with the other students but am feeling a bit bamboozled by all the tensors, boosts and Lagrangians. 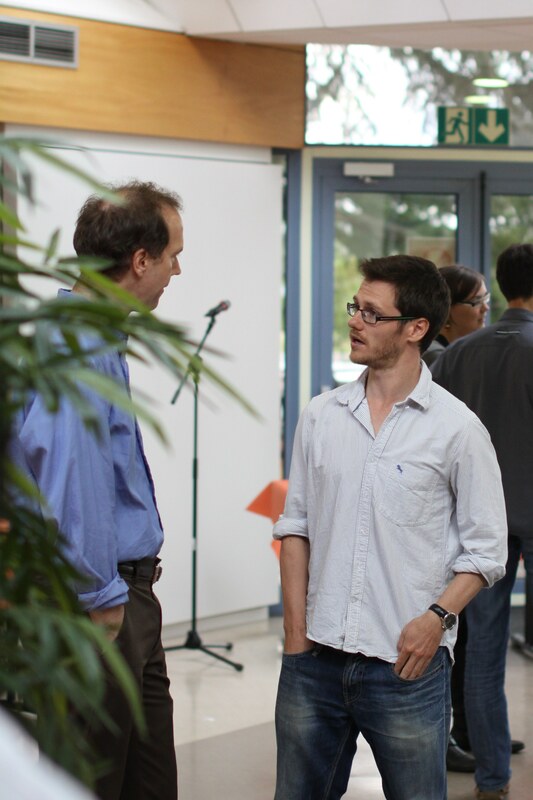 “And that’s the difference between a quark and a fork” – me telling Dr Wells all about the Standard Model. My favourite lectures however are on physics beyond the Standard Model. The no-nonsense Italian Dr Gian Giudice gives the clearest descriptions of the Higgs, Supersymmetry and dark energy that I have come across, while quirky Professor Gia Dvali reassuringly concludes that black holes are different from elephants. Phew. After each morning’s three lectures there is a half hour discussion session where the students interrogate the lecturers. While some students nip off for an early lunch I find these sessions often provide the best insight into the day’s topics.